System Requirements: DVD Photo Slideshow is compatible with Windows XP / Vista / 7 / 8. 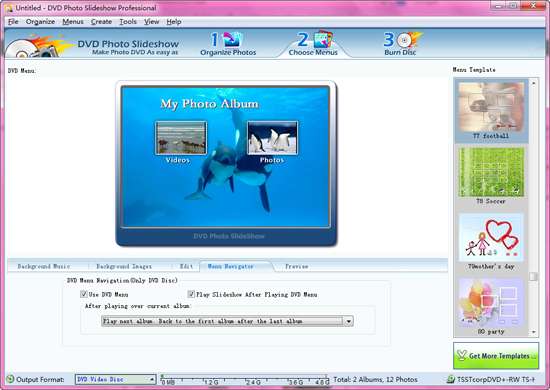 Make photo slideshow DVDs playable on DVD player and TV. Wanna display your photos on TV or DVD player for sharing with friends and family? With DVD Photo Slideshow, it has never been easier to burn photos onto DVD with music, transitions and other kinds of effects. Make video slideshows for YouTube, Facebook, iPad / iPhone and other mobile devices. Convert pictures to videos with music and transitions and then post videos to YouTube and Facebook for sharing with the world. Also you can choose video formats compatible with iPad, iPod touch, iPhone, PSP, PS3, Creative Zen, Archos. Convert digital pictures to videos in various formats. DVD Photo Slideshow support mutiple video output formats so that you can enjoy your picture slideshows on different devices. 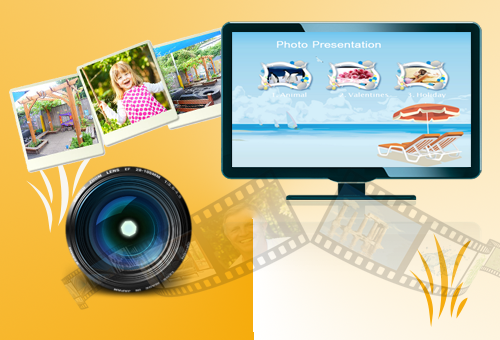 You can output a slideshow in all most popular video formats, such as mp4, avi, mpg, flv, swf, mov and more. Launch the program and add photos / videos into it. After adding photos, you can edit photos, such as rotating, enhancing, adding text. Then you can select transitions for each slide from the 300+ transition effects, apply pan & zoom effects to slides, add multiple songs as slideshow background music, select a theme, and preview the slide show. Go to "Choose Menus" tab, and select a DVD menu from 90+ menu templates. You can design the menu style as per your preference : Add background music and image, edit the menu visibility and title, set menu navigator. Before going to next step, you can click the "Preview" tab to preview the DVD effect. After customizing the slideshow, you can burn it onto DVD. Switch to "Burn Disc" tab, select "DVD Video Disc" from Output Format drop-down list, set the parameteres, and click "Burn Disc", the program will begin encoding the slideshow and burn it to DVD. When Slideshow DVD burning is finished, you can play it on your DVD player or TV. 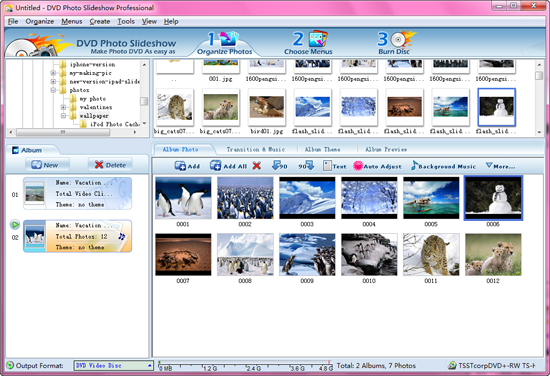 Besides DVD format, the photo DVD maker also provides multiple video output formats, such as mp4, avi, flv, swf, mov, mkv, etc. You can save the slideshow as a video format for YouTube, Facebook, iPad, iPhone, Android device, PSP and more.